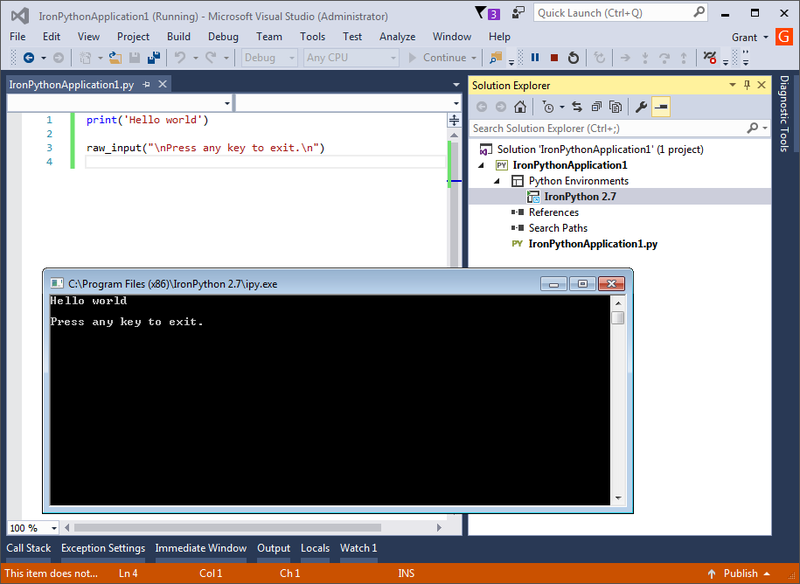 How to Develop Python in Visual Studio... and Mix it Up with the .NET Framework! I’ve been learning about the Raspberry Pi for a few months, occasionally writing about it. I usually start on a laptop using JetBrains' PyCharm IDE, which is much faster than the Pi, then move everything over when it’s done and I need to run it against the GPIO pins. 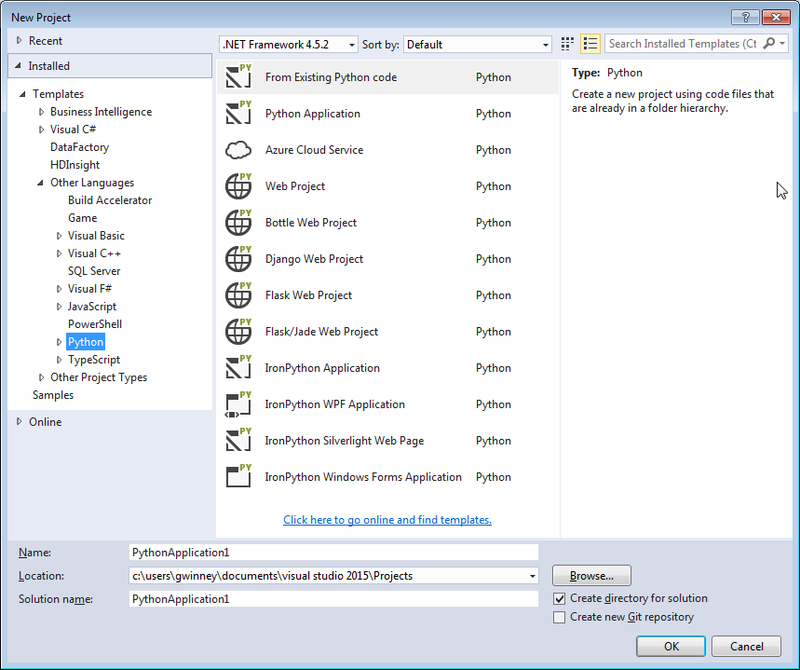 What are the Python Tools for Visual Studio? 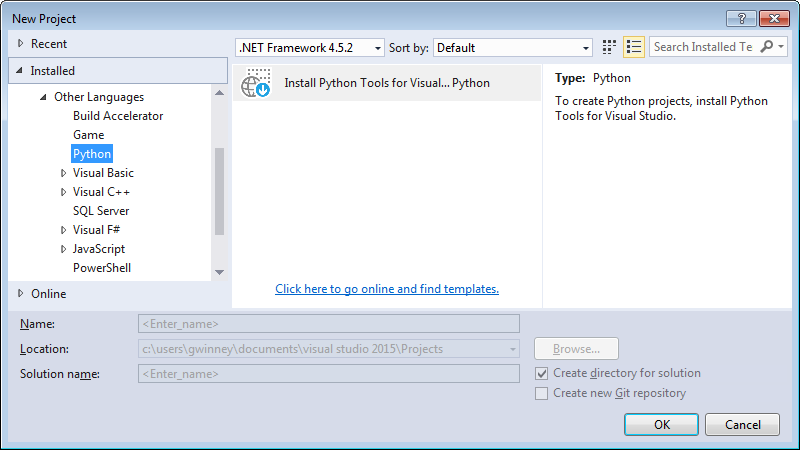 The Python Tools for Visual Studio (PTVS) plugin brings Python support to Visual Studio. 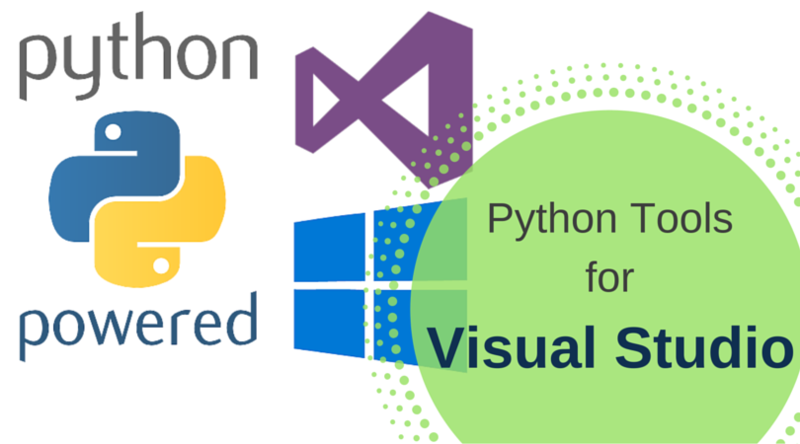 Python Tools for Visual Studio (PTVS) is an open-source plug-in for Visual Studio which supports programming with the Python language. 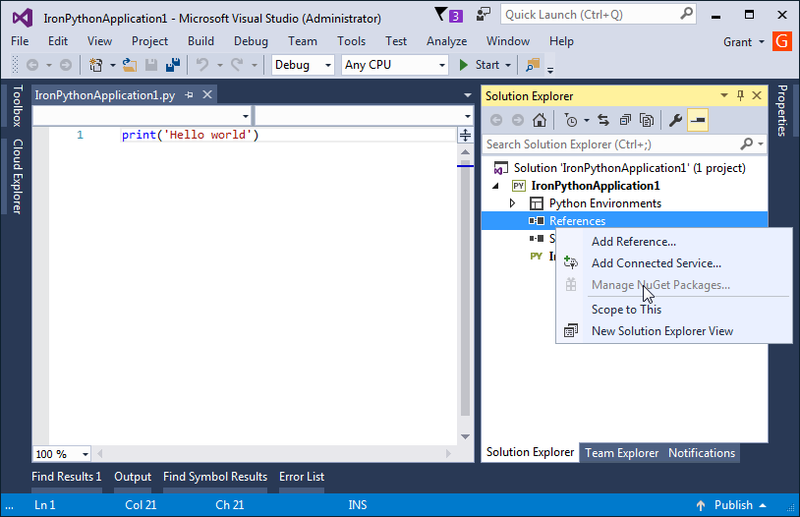 It lets you bring your own Python interpreter, including CPython, IronPython, PyPy, and more, and supports a broad range of features from editing with IntelliSense to interactive debugging, profiling, interactive REPLs with support for IPython, cross-platform and cross-language debugging support, and deployment to Microsoft Azure. According to the release notes for 2.2.4, you need VS2015 for the latest version. Or you can install older versions of PTVS, if all you’ve got is an older version of VS, but VS2015 Community is free so you might as well grab a copy. 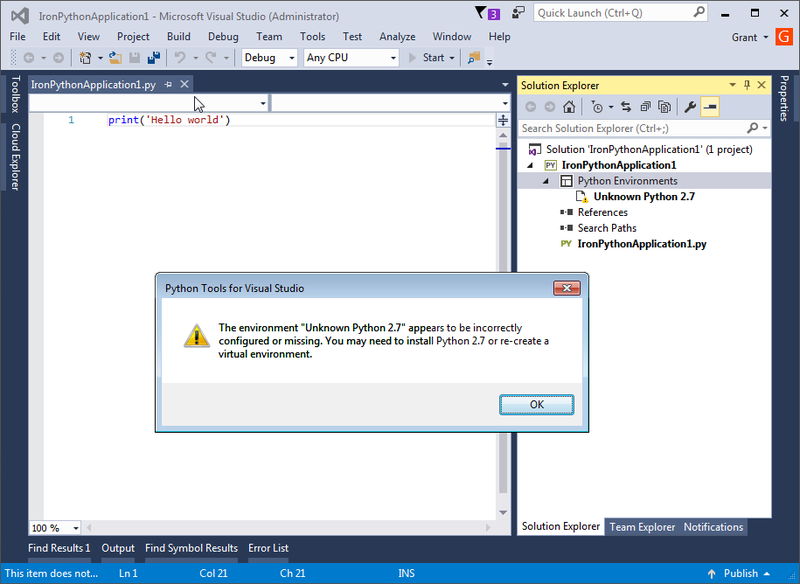 PTVS 2.2.4 and later will not support Visual Studio 2013 or earlier. If you are unable to obtain any of the editions of Visual Studio 2015, the last release of PTVS for Visual Studio 2013 was PTVS 2.2.2 and for Visual Studio 2010 and 2012 was PTVS 2.1.1. There are a few ways to get the plugin installed. If you’re currently installing an update to VS anyway, just select the option for PTVS. You can bring up the same “update” dialog any time you want, by finding VS in the Add/Remove Programs panel and double-clicking it, then choosing “Modify” in the VS window. You can go directly to the latest release on GitHub, and download an executable from there. You might want to check that page out anyway. They’ve got a sample pack you can download (more on that later). One more way. 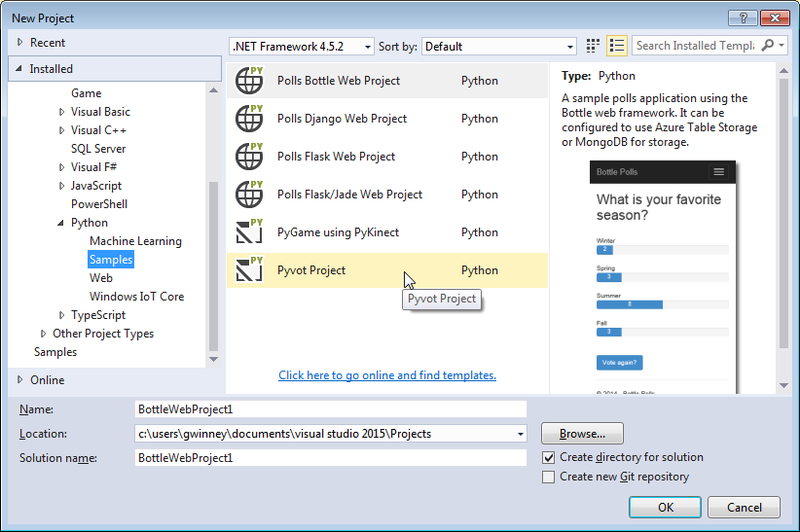 Open the “New Project” dialog inside Visual Studio and try to create a new Python project. Oops, no projects available… if the plugin isn’t installed, you’ll be prompted to do it now. Whatever way you choose, once it successfully completes, you should have a lot more options available the next time you try to create a new Python project. 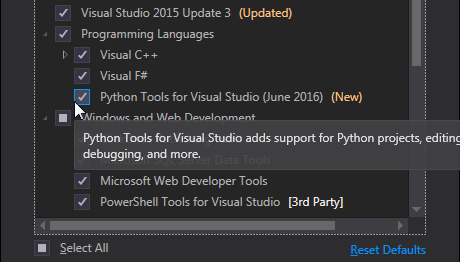 So now Visual Studio supports Python. (woot!) But you still need to install Python… or more accurately, an *interpreter *that knows what to do with the code you’re writing. There are quite a few interpreters, and they each have their pros and cons. For example, the CPython interpreter provides maximum compatibility with the official language specs, while the PyPy interpreter executes your code faster, and the IronPython interpreter integrates your code with the .NET Framework. Microsoft describes a few (there’s other helpful info on that page too), and I found The Hitchhiker’s Guide to Python: Picking an Interpreter to be a nice, straight-forward guide as well. 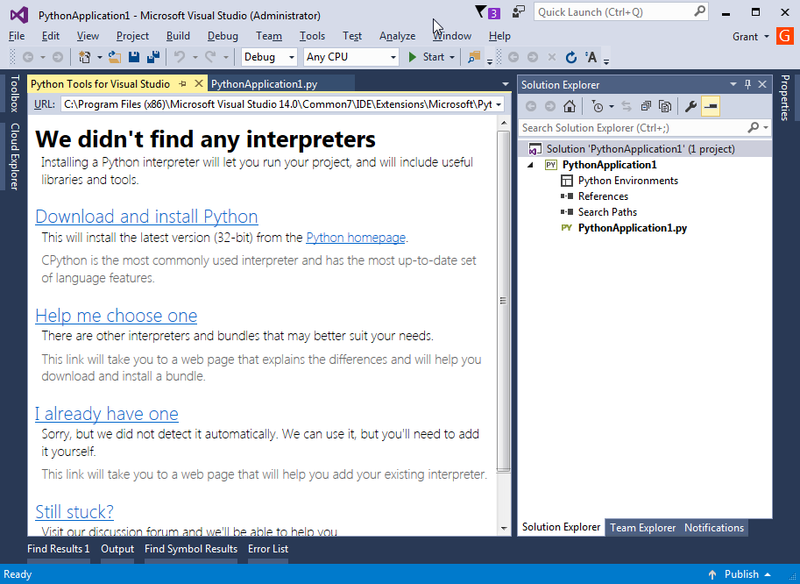 If you try to run some Python code without at least one interpreter installed, VS will tell you exactly where to go. To find an interpreter, that is. CPython is the “official” interpreter, and will support every piece of Python code you throw at it. Unless you’ve got a specific reason to do otherwise, embrace the future and download the Python 3 version. Note: One of the more annoying decisions to have to make is between Python 2 or 3. Usually, when a language spec is updated, it maintains backward-compatibility. With Python 3, they opted to dump some of the baggage from Python 2, and that means breaking changes. Python 3 is the way of the future, but many old and useful packages are still written in Python 2 and won’t just “work” with Python 3. Since we can install multiple interpreters, I installed IronPython too, so I could experiment with its .NET capabilities. It targets Python 2, but has at least partial support for 3, because both print 'hi' and print('hi') work, even though the former is Python 2 syntax and the latter is Python 3. Although you can download IronPython separately, it’s also offered as a NuGet package, which makes it really easy for you to share your code with someone. 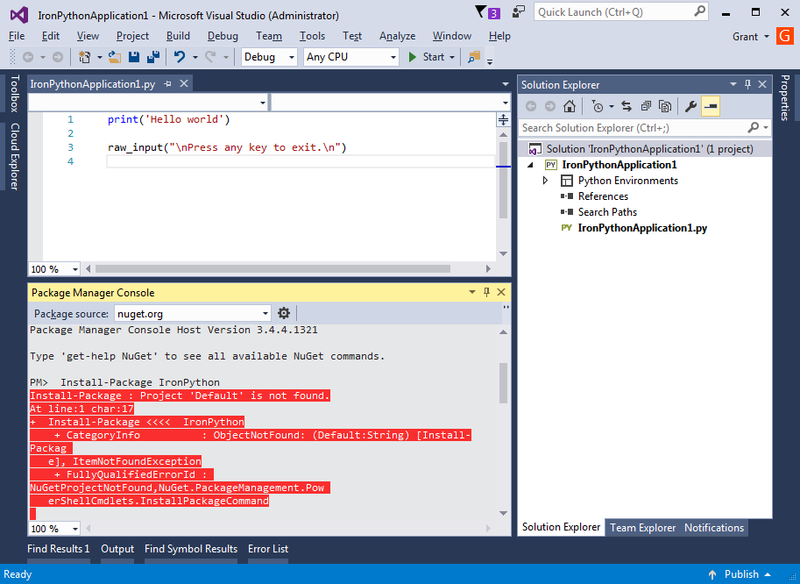 Their VS will download IronPython (and any other dependencies you’ve specified) via NuGet. IronPython is also available as a NuGet package. The standard library is a separate package. This is the recommended way to get IronPython if you are embedding it in another program. Unfortunately for me, everything I tried with NuGet failed. It was disabled in my Python project, and when I tried to install from the console, it complained very loudly. Something to figure out later I guess. 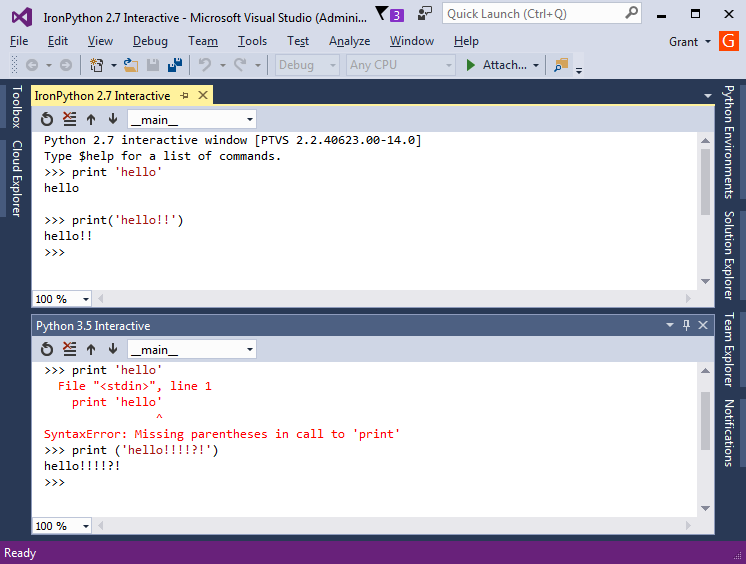 Installing the interpreter separately as described above worked just fine, and I was able to run my first “hello world” scripts from VS. Create a new Python Application and try running something simple. If you installed IronPython too, close the previous app and create an IronPython Application now. Try something simple again. Notice that creating an IronPython App loads the IronPython interpreter for us (in Solution Explorer) instead of CPython. Convenient! There are REPL (read-eval-print-loop) windows for each interpreter too, for when you want to test some Python code without the overhead of creating a project. 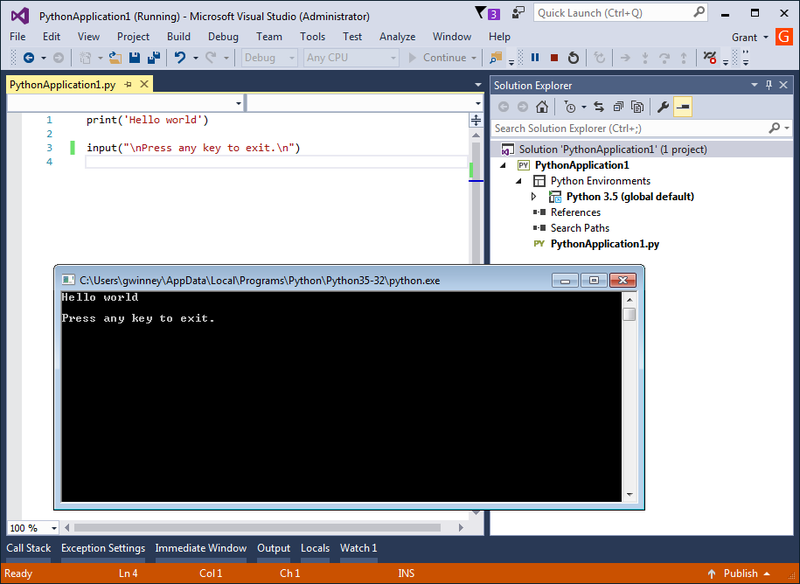 Select “View » Other Windows” from the menu (or “Tools » Python Tools”) and look for items ending in “Interactive”. You can even open up multiple REPL windows, and try out your Python 2.x and 3.x code side-by-side. I briefly mentioned the samples pack at the beginning. If you’d like to check them out, go to the release page on GitHub and download the VSIX files, then double-click each one to install them. Restart VS and you should see some new projects available under Python. Finally, what does it mean to say IronPython integrates with the .NET Framework? Create a new IronPython Application and paste the following Python/.NET amalgamation into “IronPythonApplication1.py”. Some lines are passing the result of .NET functions to Python and vice-versa… it’s more seamless than I imagined at first. That’s it for now. For someone familiar with the .NET Framework, this may save a lot of time and even prevent you from reinventing some wheels (there’s a lot of functionality built into the .NET Framework… almost anything you need is in there). What do you think? Did you find this useful or interesting? Run into any weird issues? Share below!